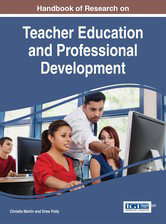 The Handbook of Research on Teacher Education and Professional Development investigates current initiatives and approaches in educational programs. Focusing on research studies and theoretical concepts on innovative projects related to teacher education and professional development programs, this book is a pivotal reference source for academics, professionals, students, practitioners, and researchers. Chapter 18: Potato, Pot-Ar-To. Tomato, Tom-Ar-To: Is Teacher Quality and Teaching Quality the Same?